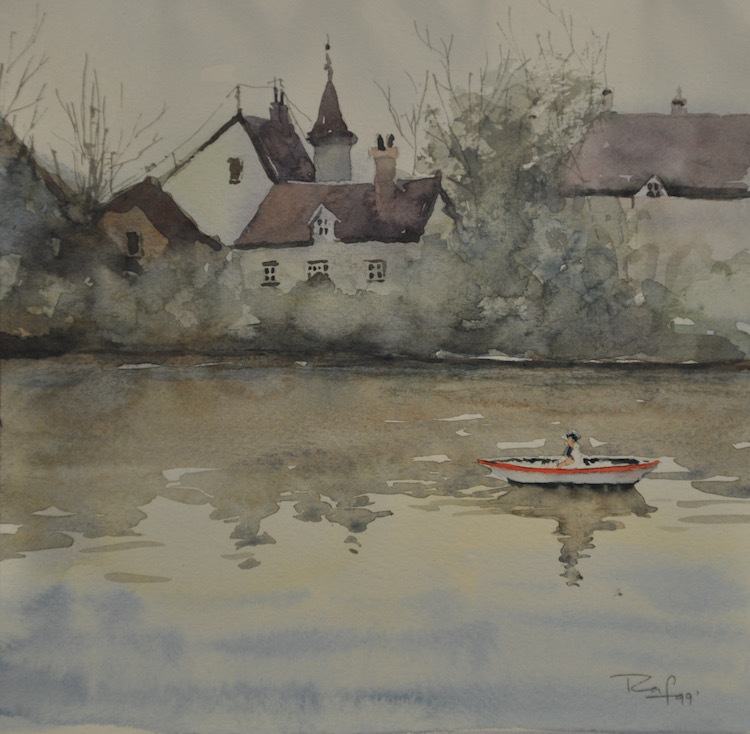 Nik Rafin, despite being trained in photography, clearly has a flair for watercolour as well. With cool colours, he creates a tranquil atmosphere out of a humble fishing village and it is as if the viewer is right at that place just by viewing this piece. One can almost see and feel the boats lightly bouncing due to the water current, the stillness of the air save for a gust of wind every now and then as well as the green hills in the distance, accompanied by a clear, calm sky. The realness of this piece is even more plausible as one glances at the waters _ the accurate, detailed and careful reflections in the moving waters. This piece somehow, feels like home. Nik Rafin studied Advanced Photography in the USA and pursued a Minor in Fine Arts at the Milwaukee Institute of Art and Design. He was an illustrator for Milwaukeeês newspaper, The Marquette Tribune.